This Comic-Con yearly program usually consists of a panel of women from various action movies. This year focused on one, actress Charlize Theron. The host is Entertainment Weekly’s reporter Sara Vikomerson. Charlize, who won a best actress Oscar for the film Monster, has also appeared in 2 Days in the Valley, The Italian Job, Prometheus, Aeon Flux , Snow White and the Huntsman, Fate of the Furious, and Mad Max: Fury Road. Her latest film is the upcoming Atomic Blonde. In Atomic Blonde, Charlize plays an undercover British spy sent to Berlin to investigate a murder, unknown to her, someone wants her killed. 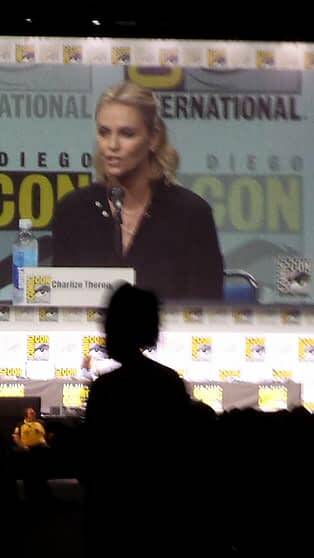 Charlize agrees that after director David Leitch saw her physical agility, on the set, he rechoreographed all of the action sequences with her. Leitch, having directed the first John Wick film, knows how to film scenes. Growing up in South Africa, Charlize remembers Sigourney Weaver and Linda Hamilton as being women who were Kick Assume role models. Having her own production company, she had been looking for a project she could star in. Charlize found Atomic Blonde, it was an unpublished graphic novel called The Coldest Day, by Antony Johnston and Sam Hart. She found great potential in the character of Lorraine and it was something that she really loved. She points out that you don’t learn a lot her back story. An eight-minute action sequence is shown , starting out with guns and ending with Charlize going hand to hand with some KGB agents when the bullets run out. Charlize points out that it was important to her that Lorraine fights the way a woman would actually be fighting. She found herself thinking, “could a girl do this?” Charlize wanted to make a movie and not have anyone come up to them and say a girl can’t do that. This was very important to her. Punching with your fist really hurts. For a woman, you can break every Boone in your hand. She used her elbows, her knees, her entire bodyweight to throw. “I can’t fight the same way as a guy but that doesn’t mean that I fight even less or even less better. ‘Hey Arnold!’ It’s Great To See You Again…In The Jungle?